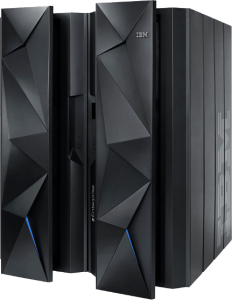 It is already two years ago that the top mainframe model z196 was introduced by IBM. On August 28, 2012, IBM announced a new mainframe model called the IBM zEnterprise EC12 (in short zEC12). This new model can have up to 120 six-core CPU’s inside running at 5.5 GHz. Although this new CPU is the world’s fastest commercial processor, it only is 25% faster, per core, compared to the 5.2 GHz quad-core processors inside the z196. The new chip is produced at 32 nanometers (nm) compared to 45 nm of its predecessor. This made it possible to double the amount L3 and L4 cache. Regardless of all these dazzling figures the zEC12 will run workloads “only” up to 50% faster. It looks like the zEC12 is proof that there is an end to Moore’s law which says that CPU power doubles every two years. Or is it because IBM carefully designed the zEC12 to be 50% faster using the same power consumption as the z196 would use for a similar workload? After all, who needs twice the processing power of a z196 (keep reading)? The zEC12 has 3TB of system memory, like the z196, but also adds a new flash memory called Flash Express, with a maximum capacity of 6.4 TB. This flash memory is created using Solid State Disk (SSD) and can be used to boost certain processes which need to be ultra-fast like system paging. There might even be exploitation by DB2 and Java of this new flash memory in the future says IBM. In the YouTube movie below Nick Sardino, an IBM System z specialist, gives a guided tour of the zEC12 and explains the technical features of the system. Who needs all this power you might ask? Well, the world is changing and we are not only producing more data but the data comes in faster than ever. To give you an example: more and more houses are equipped with smart electrical meters. The data they produce is extremely useful input for power plants who can now produce exactly the amount of power needed based on “real time” figures. But to be effective each meter generates a transaction every hour or less. Now think of what that would be if every power meter in New York would be a smart meter! To give you an impression on what the future will bring: it is already possible to produce chips at 22nm on a large scale. In a lab setup they can already produce chips at 13.5 nm. So it looks like Moore’s law is true after all.